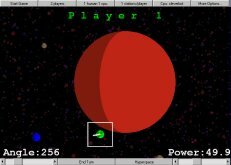 A java turn based strategy game for single or multiplayer space battles. (c) Ian Bolland 2001 - Please email me (ian@mammoththoughts.com) with any comments or suggestions. When playing: each player uses the sliders at the bottom to select an angle and power with which to fire a projectile at the opponent's death star stations. When the desired angle and power is achieved then press the 'end turn' button to let the next station else aim and fire. When everyone has chosen the angle and power ALL the missiles are fired at once and the resulting chaos can be watched. 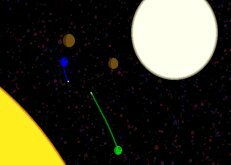 The projectiles are effected by the gravity of the planets and stars. If you feel you are in a bad location the hyperspace button will randomly teleport you to another location at the end of that turn, this is instead of firing! Click hyperspace, which will change the display from showing your angle and power to "hyperspacing..." and then press the end turn button. There are a variety of different options to chose from. Click on the buttons at the top to cycle through the options and then press the start game button to begin. Players - This simply changes the total number of players from 2 to 12. The total players is the total including computer players. 1 human 1 cpu - Click on this button to change the number of human and computer (cpu) players there are given the total number of players selected by the players button. e.g. if you want two humans and two computers click till you see '2 human 2 cpu'. 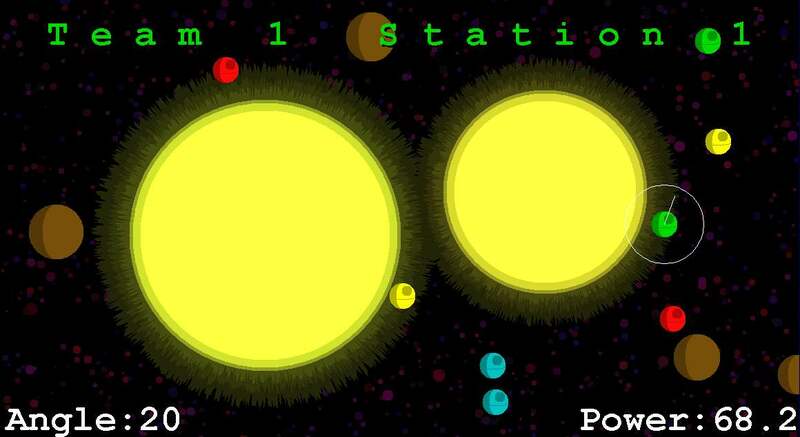 Stations/player - This changes how many space stations each player controls, there is a maximum total number of stations of 12, so if you have 3 players you can have up to 4 stations each. Be warned that the game gets very crowded when there are lots of space stations. When playing with more than one station each, aim and fire as normal for each station in your team separately. All stations on the same team are of the same colour. Cpu: cleverbot - This changes the level of the computer players. Randbots - Fire completely randomly and hit about 1% of the time. Aimbots - Roughly aim in a general direction and change power level based on conditions, they hit only 3% of the time. Cleverbots - Think about it and hit a poor 12% of the time. Superbots - Try to target sensibly, think before firing and put some thought into when to hyperspace. Will aim through wormholes! They hit an impressive 30% of the time. Megabots - Select targets in teams, hyperspace appropriately and hit a deadly 50% of the time. The default is Cleverbot, which are easy enough to kill, only select Aimbots or Randbots if you want an easy game or just target practice! They all vary in effectiveness, 50% accuracy may not sound too good, but that is an average of about 2 shots per kill! If you regularly get an accuracy of over 30% then you are pretty good. More Options... - Click here to display the second set of options. Single Game - Click to change to tournament mode and back. In tournament mode games continue by clicking on the screen after the game is over. A leader board displays hit accuracy, wins, kills and surviving stations as a running total. The overall score is 1 pt for a win, 1 pt for a kill and 1 pt for each surviving station, minus 1 pt for each own team station shot down! Stations size - This changes the station size. Smaller battle stations are harder to hit, making the game more difficult. Random size, randomly changes the size each game. 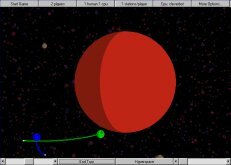 Planets - The next button determines the number of planets, either of the two random settings is recommended. Scenario selector - The last button, changes the scenario. Again random scenario (lucky dip) is probably best, but if you like a particular scenario or want to try some of the more unusual ones, go ahead. I like the wormholes scenario myself. While not being a completely educational game, it does have some learning value, teaching a little mathematicss,physics and estimation. After a little practice you learn an intuition as to the approximate trajectory of a shot. A little physics helps. 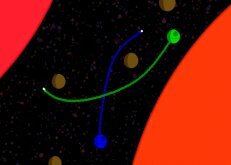 To fire round a planet or a star, a circular path will be traced if the shot has the appropriate power and is at right angles to the star. Anything else will be an ellipse shape (oval). If you give a bullet enough energy it will leave the system. If you are in a high position away from gravitational bodies then shots from further down will have less chance of hitting you. Conversely if you are close to a gravitational object you are more likely to get hit. Use hyperspace if your position is poor. Try to target the higher up battle stations first as they are more of a threat. Not all shots are possible! Consider using hyperspace to relocate if you are having trouble hitting. Sometimes changing the angle by just 1 degree makes you miss the other side of the target, fine tune the shot by changing the power instead. In a team game try to aim so that if you miss, you hit another one of them, and not one of your own team! If you fire a projectile when there is only one gravitational body, expect that it is likely to orbit and hit you in the back! Different coloured wormholes do different things, with some types it is possible to predict which wormhole the bullet will come out of. Some wormholes teleport the bullet to a random position instead of a different wormhole, others transport shots to a random wormhole. Getting a kill through a wormhole is sometimes easier than it looks, especially if the target is close to the wormhole. If you are close to a wormhole, you might want to use hyperspace to try and get to a safer position. Be especially carefull in the big wormhole scenario, it is very easy to kill yourself instead! Black holes are invisible, in random scenario mode (lucky dip) they are rare, but look for the signs. If you see a large gap in the middle of the map, it might be a black hole. If you want to stay where you are in the hyperspace scenario, use hyperspace! If the game is crowded then go for quick easy kills in the first few rounds and think tactically in multi player games: take out the winning player first. Occasionally any scenario may experience rare objects like black holes, wormholes or white dwarfs. 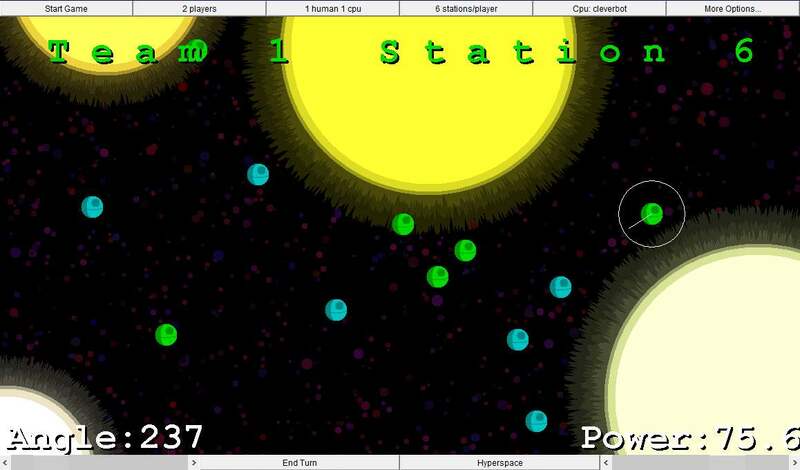 If you find the game too easy, increase the number of planets and decrease the station size to make things harder. Also try higher level computer players (superbots or megabots). If it is too difficult, then make the stations bigger and use lower level computer player (randbots, aimbots or cleverbots). The game is most fun with another human player, remember you can play with up to 12 players, which is true chaos! The game may run slowly or not at all on very very old computers, I have not tested it on pc slower than 233MHz for which is was not too bad. 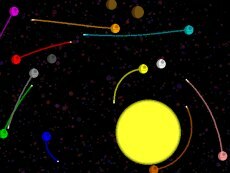 Try using less planets and players to improve speed. The applet is 700 by 500 pixels and should fit comfortably on a 800 by 600 resolution screen. A large screen uses much more processor power and may need a powerful computer. If the game is really slow then consider running the game with the computer in a low resolution mode. The java applet should load quite quickly because there is no images or pictures to load, they are all generated inthe program that is only 80k in size! The game has no sound at the moment so if you are not getting sound effects that is because I haven't put any in yet. That is something I will get round to at some point, although sound effects in space, come on (but there were sound effects in the star wars movies?)! Please note that if you use the game, you do so at your own risk. I cannot have tested the game for every platform and therefor I don't know how it will behave on your machine. Java is a very safe and secure language, at most if the game crashes it could crash your browser, but I can't be 100 percent sure. So to put it another way, you don't have permission from me to use the software unless you are prepared to do so at your own risk. If you worry about this or have any questions, please email me. 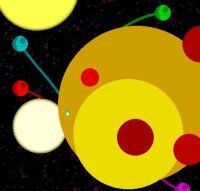 Please try my other multiplayer game: Light cycle duel, a 6 player tron game. If you are interested in the technical details of how the game works then have a look here. Mammoth Thoughs is the name I am using for the indie game design outfit for the sequal: mammoth thoughts. The sequal: mammoth gravity battles is going to be amazing, with full 3D graphics and gameplay, story based missions, multiple weapons, ship and planet movement. I would love to hear your comments and suggestions, please email me at ian@mammoththoughts.com.